What's the Story Behind Woodbury's Medieval Stone Tower? What is it about medieval dwellings that people find so compelling? Maybe because we live in an age of less-permanent architecture, there's something reassuring about the impenetrable walls of stone castles and towers that reminds us of the old adage "They sure don't make them like they used to." For sure, "they" don't build many structures anymore like the one off Route 14 in Woodbury, not far from Sabin Pond. There, travelers with an acute eye will spot what looks like a single stone watchtower rising from a deep depression in the hillside. Sadly for curious onlookers, they'd be ill-advised to venture too close to the tower. Signs indicate that this is private property, and one ominously warns, "No trespassing. Violators will be shot. Survivors will be shot again." Even from the road, the cylindrical stone fortress has a quasi-mythical allure, like the fairy-tale tower from which Rapunzel let down her hair. An arched wooden door at its base is decorated by a wrought-iron gargoyle knocker, and there's a single, arched window about halfway up the opposite side. 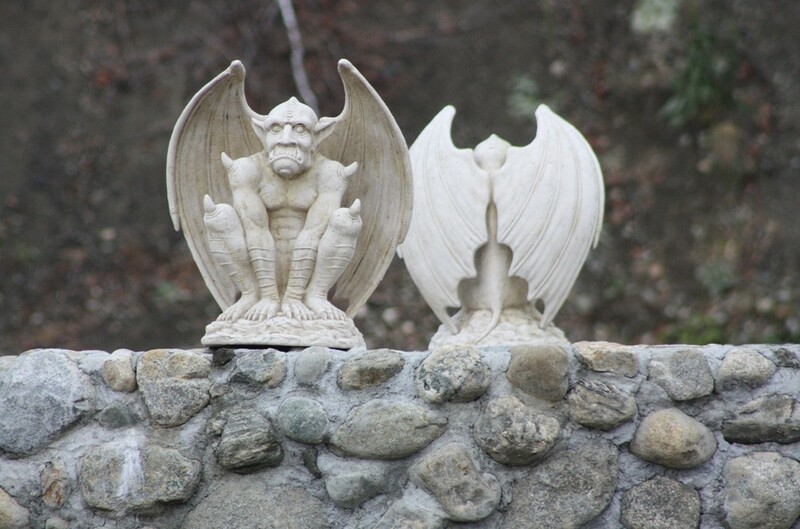 Perched on the rim of the parapet, six gargoyles glare down on two green ponds surrounded by similarly constructed stone walls. This mini-castle lacks the usually obligatory moat, but it does overlook an artificial island that's accessible via a wooden bridge, as well as several stone stairways leading down to the water's edge. From a distance, the tower doesn't appear large or comfortable enough to serve as a permanent, or even seasonal, dwelling. So why is it there, and for what purpose? Is it a bastion to guard against marauding armies from the Northeast Kingdom? A stone cairn for severely lost or nearsighted hikers? A rook in a giant-scale chess set that will soon decorate the central Vermont landscape? WTF? Alas, the truth is nothing so extravagant. Woodbury town records reveal that the property belongs to Scott McCullough, who in 2009 was issued a permit to construct the 24-foot-tall tower. The 59-year-old owner of McCullough Crushing, in Middlesex, he's much friendlier than his no-trespassing signs would suggest. When reached by phone, McCullough is happy to talk about his pet project — provided we make it clear that no one is welcome on his land in his absence. As McCullough explains, the 22.7-acre property is a now-defunct gravel pit that once belonged to his father, who started the rock-crushing business. Beginning in the 1950s, the quarry was mined for rock and gravel for local contractors and town road crews. McCullough moved onto the property in 1980 and has lived there ever since, even after the gravel pit closed in 1990. "It used to be an awful eyesore," he recalls. "People were throwing garbage and tires in there." In an effort to spruce up the land and make it more attractive, McCullough began using many of the leftover rocks that were too large to go through his crushers to frame out the pond, and then to build the artificial island. Once those projects were completed, McCullough got to work on the tower, which he designed. It has a base 18 feet in diameter and a steel spiral staircase leading up to an observation deck. The walls are four feet thick, tough enough to withstand any battering ram, catapult or trebuchet. And the gargoyles on top? "I got them on eBay," McCullough admits. "You can get anything on eBay." So why'd he build it? "It's just something to keep me busy on the weekends," McCullough says with a chuckle. "Maybe I have too much time on my hands. I don't know." 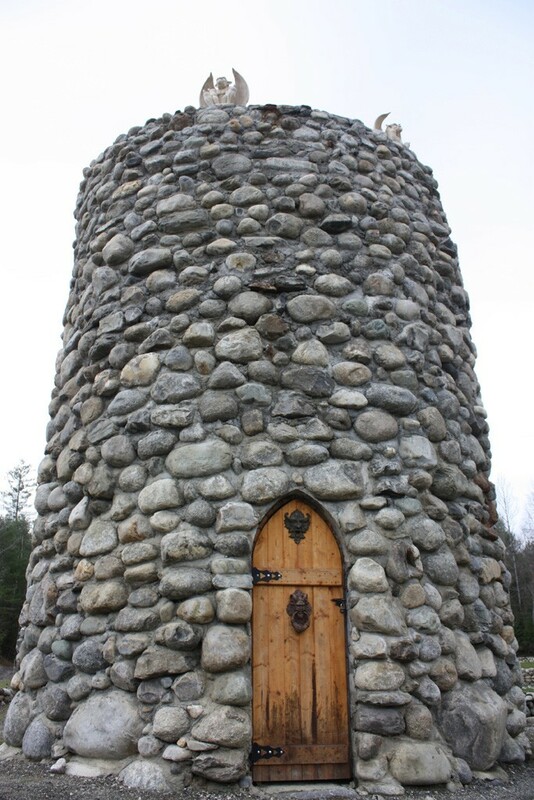 McCullough's tower isn't the first such medieval structure in Vermont to provoke readers' curiosity. This past June, Seven Days profiled a castle that sits on more than 10 acres in Georgia. That one comprises 12 bedrooms, two full bathrooms, one half bath, a kitchen, six fireplaces and nearly 19,000 square feet of living space — assuming it's ever finished enough to live in. Currently it's not. The pet project of a local stonemason and pyrotechnics expert is still on the market for $925,000. At first glance, McCullough's tower seems like an ideal venue for hosting medieval-themed weddings, jousting matches, Dungeons & Dragons festivals and other Renaissance fare. He's not interested. Notwithstanding his willingness to discuss his weekend hobby with a reporter, McCullough says he prefers to enjoy his stone handiwork exclusively with family and friends. In fact, the stone citadel has hosted only one wedding since he built it — his own, just a few months ago. As for the hall in which the newlyweds now dwell, it's not quite as extravagant. They live in a mobile home at the top of the hill.